Hey Holly Golightly: Consistency: A Gosh-Darn-Why-Didn't-I-Think-Of-It Formula For Success! 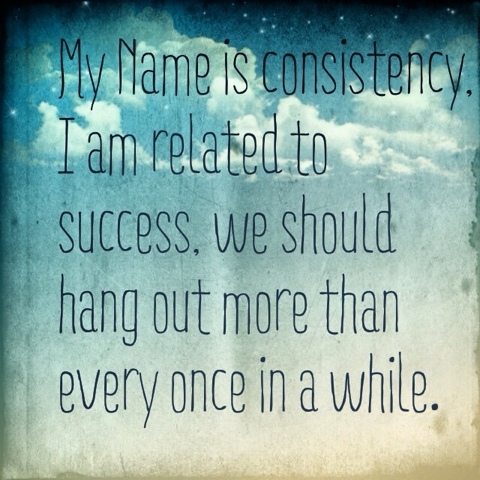 Consistency: A Gosh-Darn-Why-Didn't-I-Think-Of-It Formula For Success! If I had a dollar for every book I have read about the fool-proof, easy peasy, lightening-fast track to success, I would have $66.50: Oh come on, did you finish A place of Yes by Bethenny Frankel? The point of course (and I definately have one), is that said books are everywhere. AND look, I can say, with conviction, I've learned many special little formulas that have helped me over the years. Dr Phil, Eckhart Tolle, Morgan Scott Peck and that guy from the infommercials who walks across fire and was in Shallow Hal. BUT, I have a beef with all of you. You failed to mention what I have since discovered to be the most important piece of the success puzzle: consistency. Or maybe you did mention it quickly, somewhere on page 170 but there were no italics, bold type, flashing neon lights! I'm a slow learner! EMPHASISE damn it! Whichever formula you use, whatever rule book you have in play, regardless of the self-help guru you worship the only way to get anywhere is to do something and do that something consistently. So why is that for some of us (me included) a new plan or activity fills us with excitement and will to succeed only to have it replaced with boredom and a lack of enthusiasm just a few short weeks or days later. Why does standing in the self-help aisle at the bookstore dizzy us with possibility and hope and catapult us towards the counter only to see that book purchase wind up under your bed with last months favourite nail polish colour (coral pink? What were you thinking?) gathering dust? So often we blame the plan. It didn’t work so it must have been flawed, right? Better get a new plan. But let’s sit with this for just a sec. Let’s say the plan, is in fact, perfect. Let’s say just for kicks, that there has never been a better plan in the history of the entire world and the only reason it didn’t work is because you weren’t consistent in exercising it? OMG! Imagine someone suggesting you, and not the plan are to blame for your complete lack of success. Preposterous!! Remember Cher Horwitz lecturing her "clueless" friend Tai? "Exercise must be done everyday, not just sporadically!" And like so many great things we can take from the movie, Clueless, we should add this to the list. Because while the concept seems glaringly obvious, consistency is where so many of our plans fall down. So whether it is your diet, exercise regime or beauty routine remember that you have to do it everyday – not just sporadically.